Due to the scale and complexity of data sets currently being collected in areas such as health, transportation, environmental science, engineering, information technology, business and finance, modern quantitative analysts are seeking improved and appropriate computational and statistical methods to explore, model and draw inferences from big data. This book aims to introduce suitable approaches for such endeavours, providing applications and case studies for the purpose of demonstration. 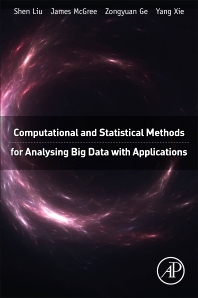 Computational and Statistical Methods for Analysing Big Data with Applications starts with an overview of the era of big data. It then goes onto explain the computational and statistical methods which have been commonly applied in the big data revolution. For each of these methods, an example is provided as a guide to its application. Five case studies are presented next, focusing on computer vision with massive training data, spatial data analysis, advanced experimental design methods for big data, big data in clinical medicine, and analysing data collected from mobile devices, respectively. The book concludes with some final thoughts and suggested areas for future research in big data. 1.2 What is this book about? 1.3 Who is the intended readership?